An HIT Moment with ... is a quick interview with someone we find interesting. Peter J. Pronovost, MD, PhD is Professor, Departments of Anesthesiology and Critical Care, Surgery, and Health Policy and Management; Medical Director Center for Innovations in Quality Patient Care; and Director, Quality and Safety Research Group, The Johns Hopkins University School of Medicine, Baltimore, MD. On September 23, Peter was announced as a 2008 Fellow of the John D. and Catherine T. MacArthur Foundation, recipient of a so-called "genius grant" that will pay him $500,000 over the next five years, no strings attached. The fellowships are awarded to "talented individuals who have shown extraordinary originality and dedication in their creative pursuits and a marked capacity for self-direction" to "encourage people of outstanding talent to pursue their own creative, intellectual, and professional inclinations." What was it like hearing that you had been named a 2008 MacArthur Fellow? Amazing. I do not consider that I fit the bill of genius. What I do is try to make complex ideas simple and use them to improve patient outcomes. What will you do with the grant? I’m not sure. I have been toying with trying to make a checklist maker, an IT tool to tap the wisdom of crowds and make a more efficient knowledge market. I believe certain markets are so fundamental to society, like buying a home, healthcare, and retirement, that we need to guarantee that they are efficient. What is the status of your "List" projects and have you had any interaction with IT vendors? Still working on it and not working with vendors. I am trying to work out the "plumbing" first and see what product we can create. What are your big projects going forward? We are developing programs for MRSA and decubitus ulcers, evidence-based checklists and measures. Are you a star back at Hopkins now? I am not a star. I am very much a doc in the trenches doing patient care. That is what keeps me grounded and provides ideas of what we can fix. I am delighted that patient safety was recognized. It has been very hard to get this field accepted as a legitimate science or as important in healthcare. Though we have a ways to go, we are making progress, and the MacArthur certainly helps. Thanks Mr H and congratulations to Dr. Pronovost … well deserved. 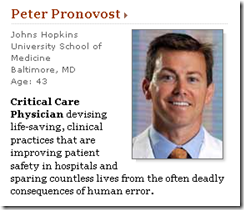 We are all students of Dr. Pronovost’s methods for perfecting patient care.